Strangely enough, for just the second time all year, our warmest place in the U.S. is in a place you would expect it to be – the South. This particular city is so far south that it sits right on the Gulf of Mexico and is home to beautiful white sand beaches, which were probably all the rage in this extended summer month. 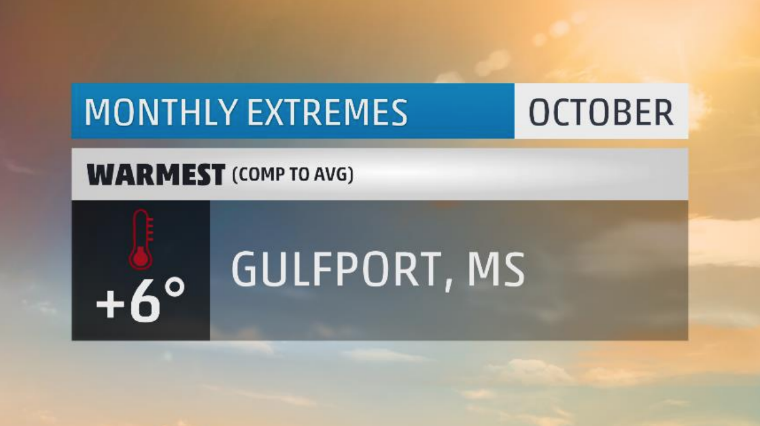 Our warmest spot in the U.S. this month was none other than Gulfport, Mississippi. Out of the last 125 Octobers on record, 2018 would go down as the third warmest at just about six degrees above average. 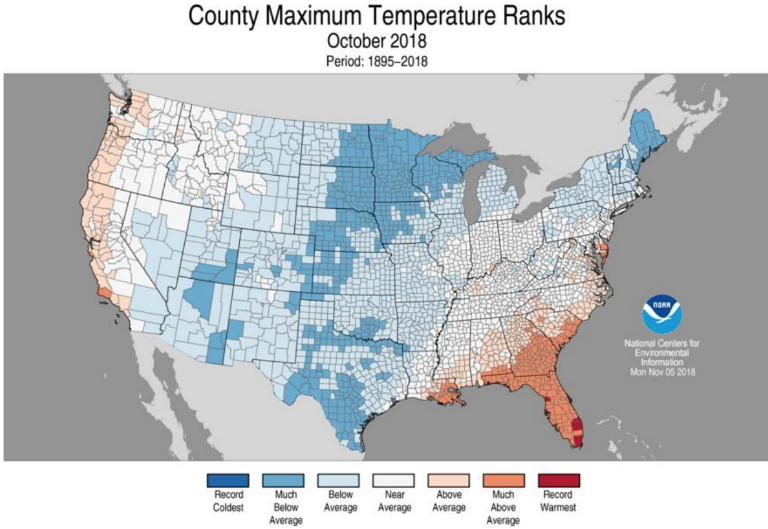 Eighty percent of October’s days saw above average temperatures including five that were at least ten degrees above the normal mark. They tied the October record for 90-degree days at seven, and boasted the third highest number of 85-degree plus days at seventeen. The month started with an impressive five straight days of 90-degree temps. No one likes an October heatwave! As with most of our warm cities this year, overnight lows were oppressive. In a month where the average low ranges from 64 to 54 degrees, 27 nights were warmer than 64 degrees. Surprisingly, no record highs and just one record warm low were set for the entire month. Gulfport is on pace to end 2018 as the 6th warmest year on record. Who said beach season had to end after Labor Day? 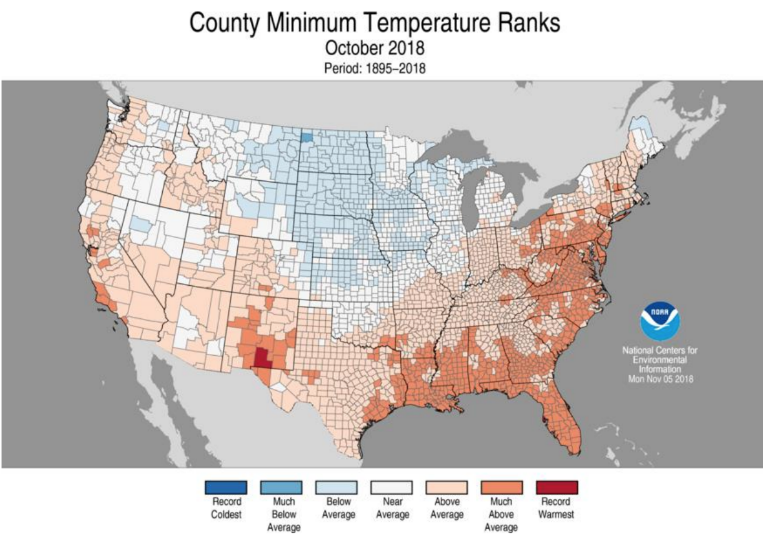 It’s easy to pick out the predominant weather pattern when looking at the above map showing places that had either one of their top 10 warmest or coldest Octobers in 2018. The South was under the influence of a stubborn area of high pressure which kept the weather rather stagnant for the first half of the month. It wasn’t exactly sunshine and dry heat either. Cloud cover helped to bottle up whatever heat there was making for unseasonably warm low temperatures. Where there was cold, however, was throughout the nation’s heartland. Season-changing cold fronts ushered in waves of cooler, Canadian air in stark contrast to September’s warmth. Unfortunately for those in the South patiently waiting for one of these cold fronts to pass through, it would take until late month to see much in the way of any changes. 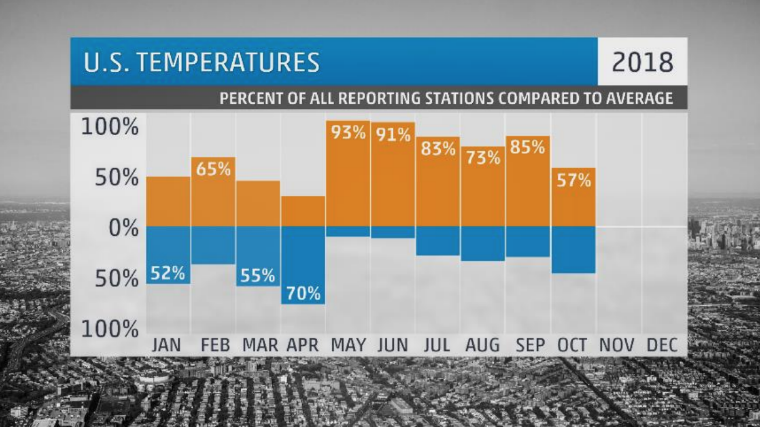 October did see a significant reduction of cities with above average temperatures. In a stretch from May through September, almost three-quarters of the U.S. saw month-after-month of temperatures above the long term average. With that said, October still saw over half of U.S. cities warmer than average, making for the 6th month in a row to pull off such a feat. Not to sound like a broken record, but once again the majority of weight in these cities with above average temperatures comes not from afternoon high temperatures but from overnight lows. Compare the map above of October’s high temperatures relative to normal compared to the map below of lows. That’s at least 14 states with near-record overnight low temperatures. Sound the kazoos and fire the confetti; we have a repeat winner for coldest spot in the country! 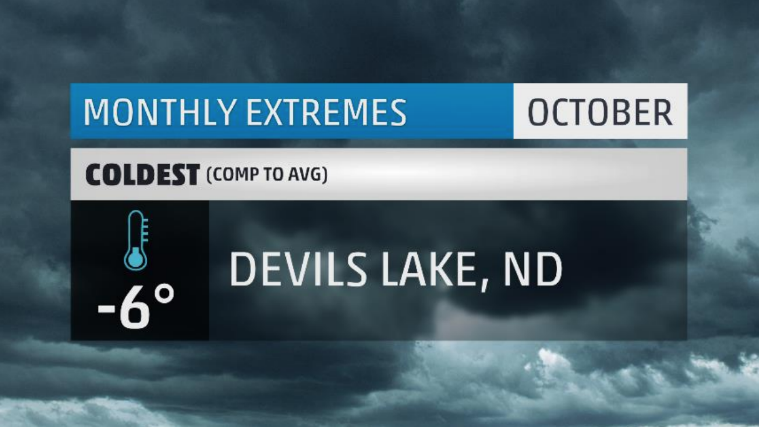 Well, it’s probably not so exciting for the folks in Devils Lake, North Dakota, though, as they witnessed their coldest October on record in 2018. Temperatures were below average on 20 of October’s 31 days this month with seven of those days coming in at least 15 degrees below normal. Twenty-three highs failed to reach 60 degrees – that’s the most for any October. Nine days failed to reach 50 degrees – that’s the most for any October. There was even one day that stayed below the freezing mark – that’s tied for first for any October. Conversely to all the talk about warm overnight lows, they were frigid in Devils Lake. Twenty-nine lows fell below 40 degrees – that’s the most for any October. Twenty-two lows stayed below freezing – you guessed it, most for any October. 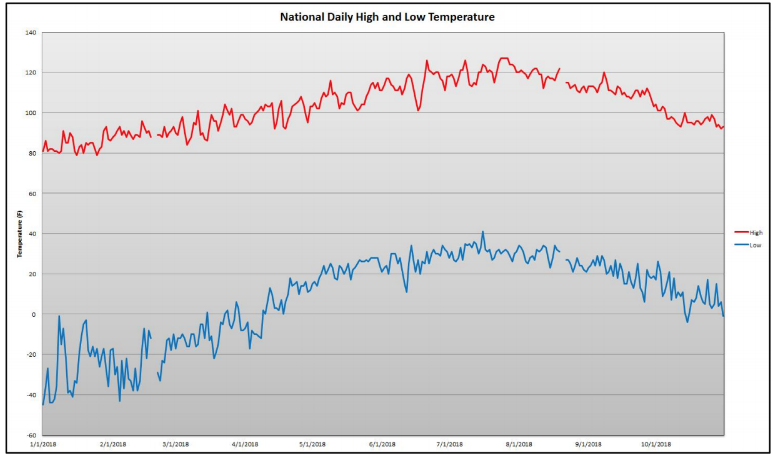 Finally, five lows hung at-or-below 20 degrees – yet another October record. In total, there were 12 daily record cold high temperatures and another 12 daily record low temperatures set this month. This included the 3rd coldest October high of 31 degrees and the 4th coldest October low of 17 degrees. Oh, but the records don’t end there. See, October can be a bit bi-polar. Even with twenty-four cold weather records being broken, Devils Lake also saw their 8th warmest October high temperature of 72 degrees. That was warm enough to set a daily high temperature record. And by the way, the low temperature just 24-hours prior was a whole 53 degrees colder at 19. Talk about a temperature swing! Currently, Devils Lake is on pace to have 2018 end as their 3rd coldest year on record. As for the most extreme temperatures this month, look no further than Death Valley, California who started the month with a 104 degree high temperature. On the cold side, a low temperature of negative four was recorded at Berthoud Pass, Colorado. 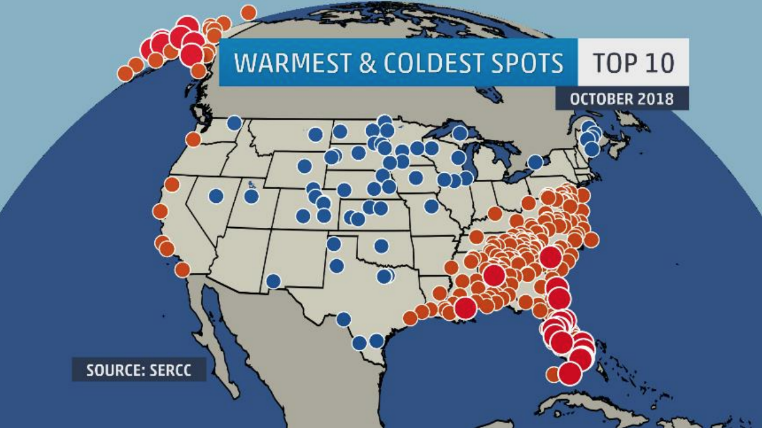 Now you may be asking yourself, why didn’t these cities make the top spot for warmest and coldest spots? Well, simply put, these cities are always warmer and colder than everyone else. But compared to average, both Death Valley and Berthoud Pass were right on average for October. For the second month in a row, our wettest spot in the country comes to us from the Lone Star state of Texas. Whereas last month saw record rainfall along the coast, October’s rainfall would take us further inland. 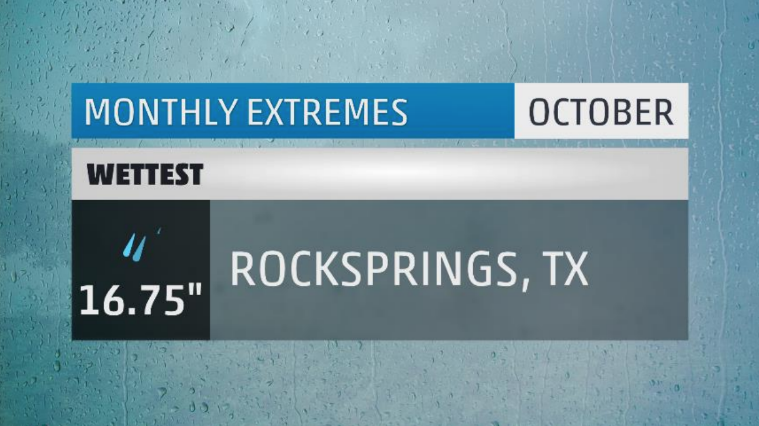 At close to 17 inches of rain, our wettest spot is none other than Rocksprings, Texas. 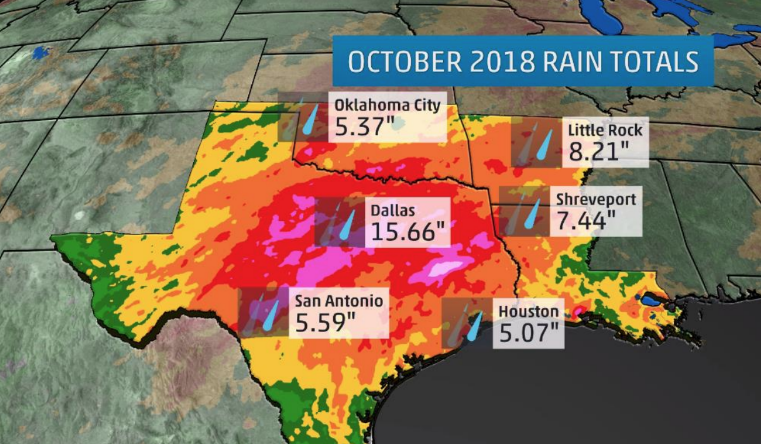 The small town of Rocksprings, which sits about two hours west of San Antonio, not only saw their wettest October but also set their wettest month on record! Sixteen days saw measurable rainfall including four with at least an inch and two with at least three inches. One of those days would set the record for wettest October day at 5.32 inches. Rocksprings would set seven of their top 10 wettest days for any month during October. Think about that! Above all, if the year were to end right now, this would already be their wettest year on record. What was the atmospheric culprit for all the rain? The large area of high pressure that kept the southeast warm also helped to pump a ton of moisture out of the Gulf of Mexico northwestward into central Texas. Couple this with persistent troughiness over the nation’s mid-section, and you have a recipe for day after day of soaking rain. The good news is that we have essentially eliminated any drought from the state of Texas. Take that a silver lining for all the dismal weather. Rocksprings was not alone in Texas as four other Lone Star cities would also see their wettest October on record. The big one is Dallas which picked up 15.66 inches of rain making for the 4th wettest month on record. Record rainfall soaked much of the nation’s heartland keeping things cold, gray, and dreary for the month of October. 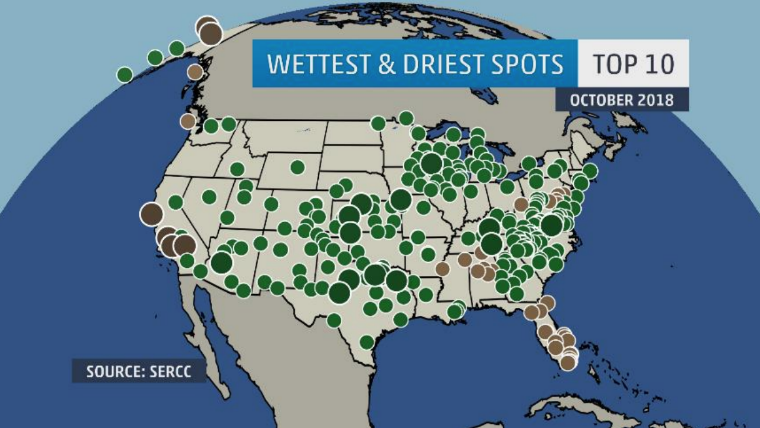 Some 276 cities would end the month with one of their top 10 wettest Octobers on record. 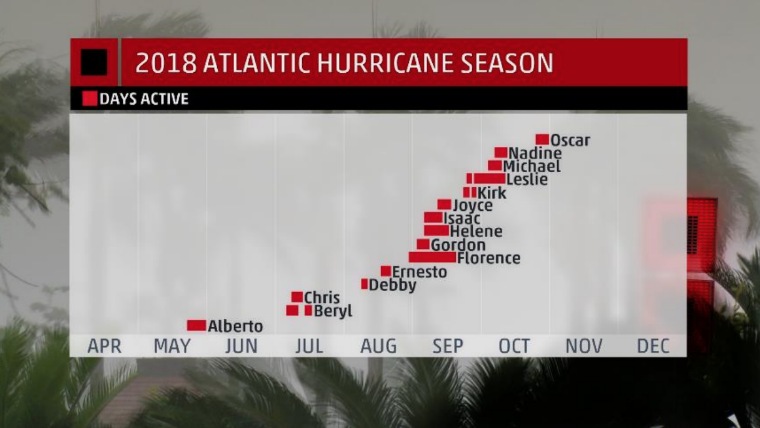 October would see four named tropical systems, with the most devastating being Hurricane Michael. 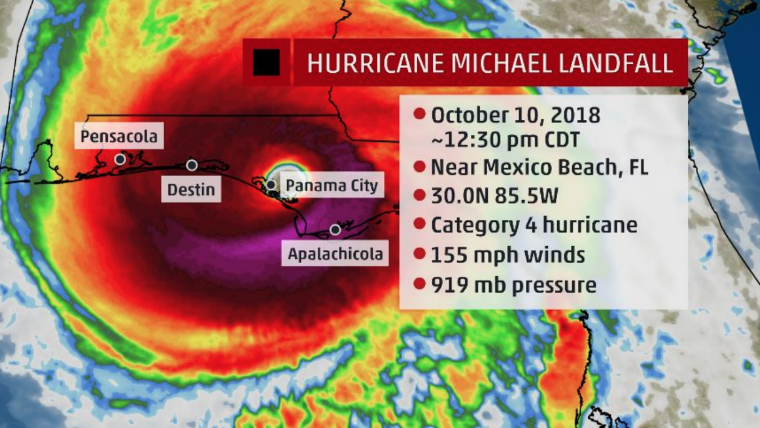 Michael would make landfall as a Category 4 storm with winds of 155 MPH. Landfall occurred on the Florida Panhandle near the town of Mexico Beach. Incredible scenes of destruction would soon follow stretching from the Gulf coast beaches up through south-central Georgia. 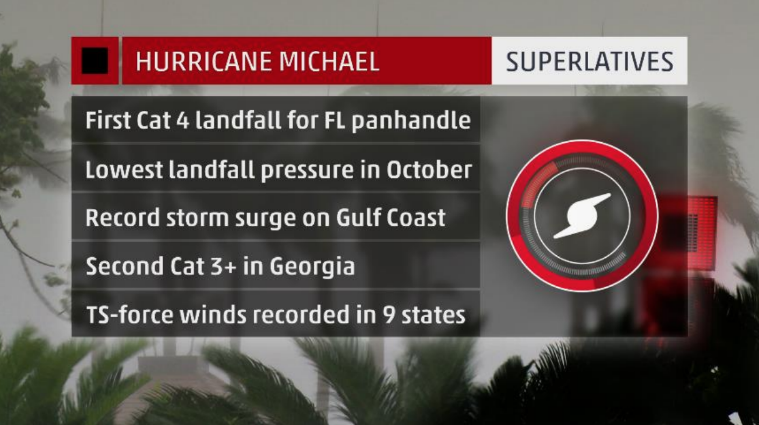 Michael would be the strongest storm to make landfall in the U.S. since Andrew in 1992. Over a million people in total would lose power and the death toll would climb above 30. Michael will certainly be a storm we will not forget any time soon. October was far and away one of the more active severe weather months of the year. 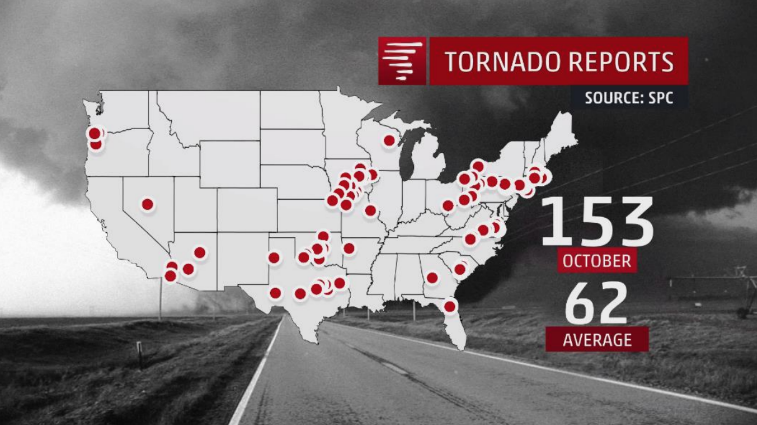 Halloween alone saw close to 200 severe weather reports including 60 reports of tornadoes and 133 reports of damaging winds. 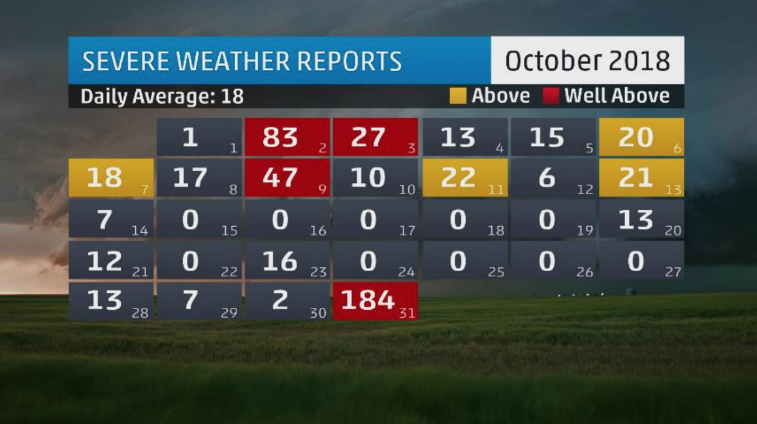 A typical October ends with around 62 reports of tornadoes for the month. 2018 would smash that with 153 individual reports of tornadoes. This would include a rare mid-Atlantic outbreak across Ohio, Pennsylvania, New York, and into New England, and multiple rounds of strong storms that lit up the Southern Plains and Midwest. 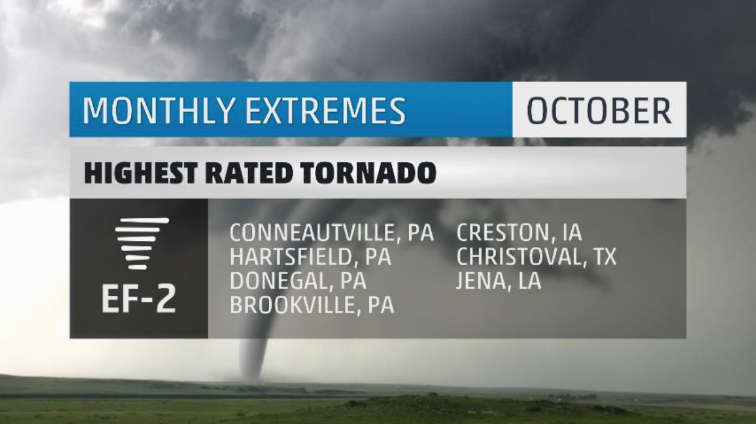 Seven EF-2 rated tornadoes would touchdown in October including four in Pennsylvania alone. The largest hail report would come out of Hatchel, Texas, where baseball sized hail fell. A severe thunderstorm would clock an 82 MPH wind at the airport in Rifle, Colorado. Switching modes now to winter as more and more towns across the U.S. start seeing their first flakes and measurable snowfall of the season. While our snowiest city only picked up 8.3 inches of snow this October, it did make for their 2nd snowiest October on record. That would be out of Grand Forks, North Dakota. Grand Forks would see four days of measurable snowfall in October making for the second most number of snowy days for any October. This includes the new 3rd snowiest October day on record which saw 6.5 inches. That would also mark their 8th earliest first snow of the season. 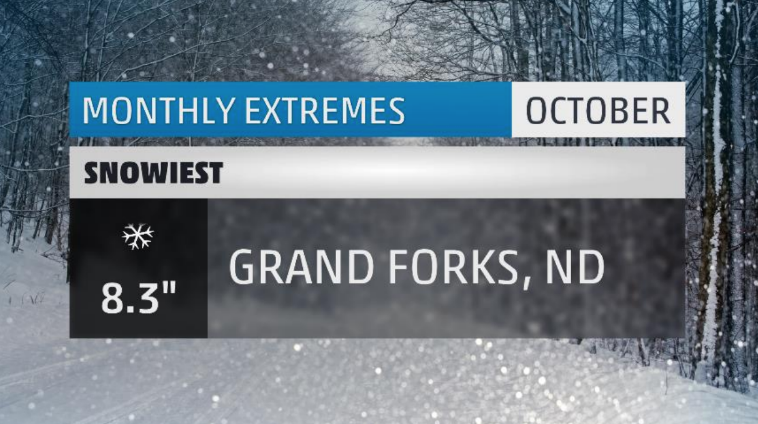 This would be the most snow they’ve seen in Grand Forks in October since 2001 when 10.9 inches would accumulate. As a snow lover, I definitely can’t wait to see what November has in store for the country. Hello winter! Most of the places that have seen their first snow of the season are right where we would expect them to be for this time of the year. 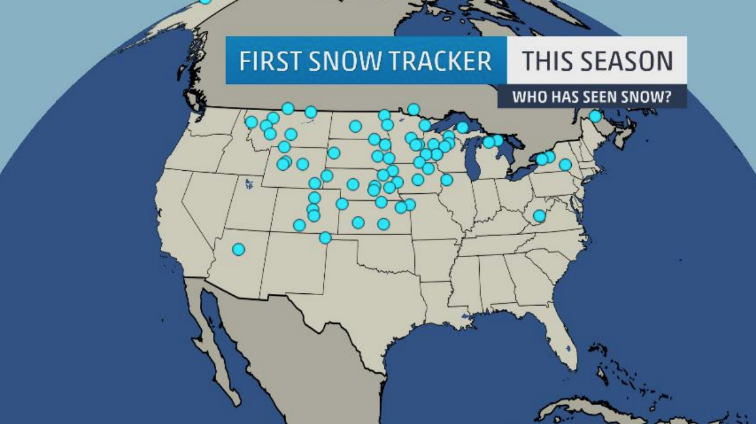 Climatologically speaking, much of the Midwest and northern Plains see their first snows by the end of October. Is your city on the map yet? From snow to sunshine we go as sunny California makes the sunniest list again this year. This month’s winner saw 28 days of full sunshine but also managed to squeeze out their 18th wettest October on record. 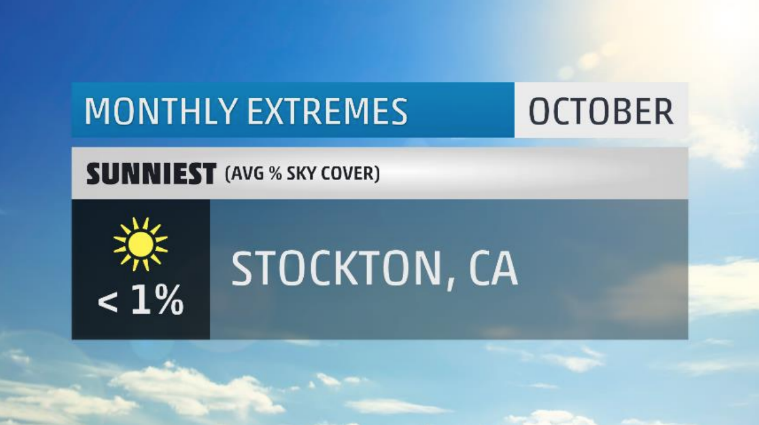 The sunniest locale goes to Stockton, California. Two days of marginal clouds was all that was needed to keep them from 100% cloud-free skies, but also enough to produce 1.28 inches of rainfall. Typically, Stockton’s sunniest time of the year runs from May through October and peaks in August. Our cloudiest spot has made this list before, and it’s no surprise as it is in one of the more cloudy spots in the country – especially at this time of year. 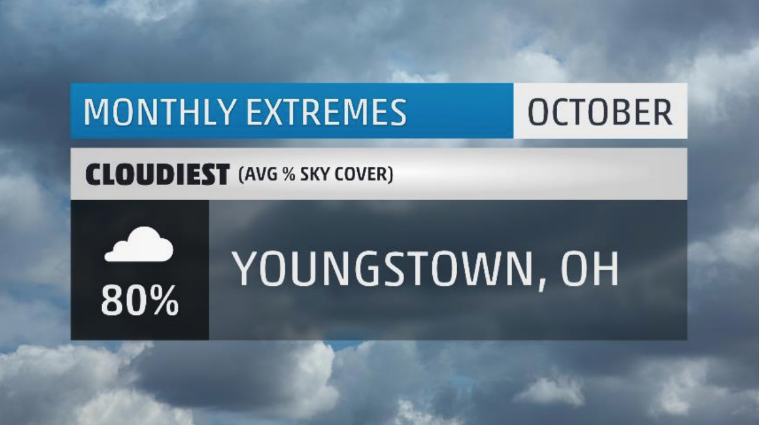 With essentially 30 days of skies being mostly cloudy or worse, Youngstown, Ohio takes the cloudy cake this October. Along with the cloud cover were 21 mornings with fog! Youngstown would end the month both wetter and warmer than average. Nineteen days would see measurable rainfall making for the 2nd most number of wet October days on record. The cloudiest time of the year for Youngstown falls from November through May and peaks in January. There you have it, the extremes for the month that was October 2018. Make sure to check back next month to see what November has in store! What weather extremes did you face in October where you live? Let me know in the comments below.